All councillors were chosen from the electorate by lot so only one of his hearers belonged (like Pericles) to The Few who owned big estates. The rest were from The Many, but all Athenians profited by some commodity the navy needed and his final appeal to the profit motive clinched every previous argument. By its fourth utterance Pericles was sick of that argument and almost sick of himself. He regarded Athenian democracy as an example to every nation, present and in future, so regretted that what most united his fellow citizens was greed. “You’re tired! Come and eat with me,” said the fourth councillor, pleased to see the great statesman show signs of weakness. He gestured toward the excellent restaurant where councillors dined at public expense and could entertain guests. “Impossible. Goodbye,” said Pericles regretfully. He was hungry but always avoided flaunting his privileges. 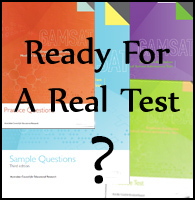 Nearly finished all the sample questions on the website already? No worries.. You can download practice papers for Section 1 and keep on learning! ‘the great statesman’ means he is a good politician. Many other councillors know him and are proud when he asks to speak with them. His experience shows in his persuasive skills, he knows how to get things done in Athens. The Few are those who own large estates. The very upper class. The Many is the majority, the rest. We can infer that this is the opposite of The Few and that they are therefore the lower classes. Based on information in the passage… and we are not given much. We know that he is proud in his country. The intellectual superiority granted to Athens by its historical position as one of the first large scale democracies. The fact that the people of Athens do not reflect Pericles’ intellect and are not motivated by greed undermines this thought-superiority of the nation and as such, his pride in it. In contrast it could be said to fortify the moral superiority of nations who would challenge the Athenian model of leadership, but this is not specific to monarchies. C and D are not supported by evidence in the passage.